Social networks like Facebook and Twitter pose the biggest threat to your network. But, as security professionals, we often pay more attention to interesting, flashy, and complex attack vectors - such as high-end APT attacks targeting nuclear facilities - than we do mundane, everyday attacks. However, in the past, mundane attacks, like emails with nasty attachments, accounted for the majority of actual breaches. So what's the mundane "malicious email attachment" of 2011? Two words-- Facebook links. Today, it's clear that the web is the most dangerous place on the Internet, and social networks are the front lines of the web battle. While the security community theorizes about the potential damage from a global cyberwar, most businesses still don't do a good job of defending against basic social network and web threats, largely because they lack the necessary security controls. 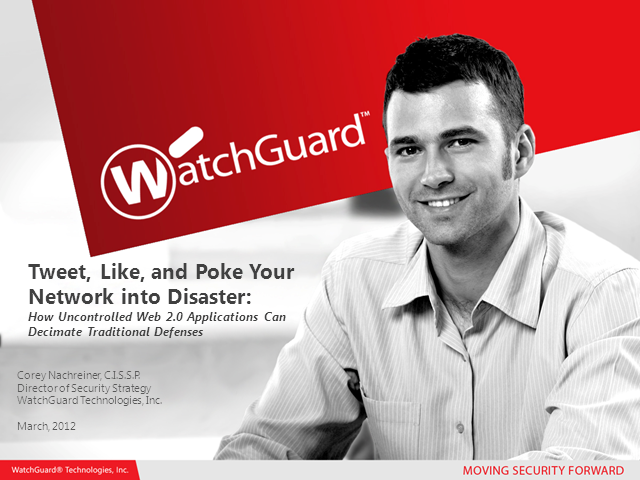 In this webinar WatchGuard's Director of Security Strategy and CISSP, Corey Nachreiner, will describe why social networks will pose the biggest threat to your network for years to come. You'll learn attributes that make social networks like Facebook especially dangerous; how attackers leverage Web 2.0 applications to infiltrate your networks, and how real-world attackers target social networks today with attacks ranging from cyberbullying to drive-by download delivery. More importantly, Nachreiner will suggest some practical network defenses and controls that will give you back the reins to your network. Corey Nachreiner, CISSP, Director of Security Strategy, WatchGuard Technologies, Inc. Presented by: Corey Nachreiner, CISSP, Director of Security Strategy, WatchGuard Technologies, Inc.